I was just a year old when my grandparents went on their first trip to Paris. Serving in the Air Force as a co-pilot in World War II, my grandfather Parker had spent some time in Europe, mostly in England. Nearly 30 years later, in April 1972 he and his wife Patricia set off for a week in Paris along with his Herald Square steno notebook and his trusty camera. My grandfather was stationed in England, Japan and Korea while in the Air Force in the 1940’s & 50’s. Endlessly curious of the people, history and culture of where ever he was, he captured what he saw with his camera whenever he had a free moment. After the service, as he continued to travel he would ask the people he met along the way about their own stories. Like many of us he loved sitting in a cafe soaking in the streets and all the people, particularly in Paris. 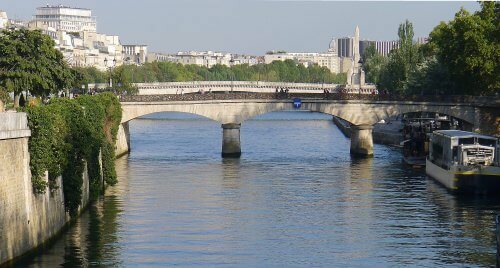 Among the photos of monuments are photos of a painter on the Pont de l’Archevêché *(at left) that he bought a painting from and he noted on the back his name and where in France he was from. He saw Paris through the eyes of its people, and fell in love with both. 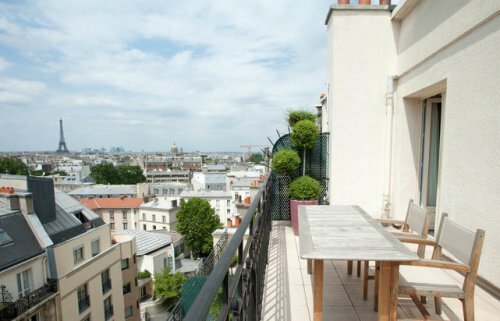 while his wife slept in, to discover the city but first, he would sit and have a coffee and a baguette. My grandfather would spend most days strolling through the streets of the city discovering Paris from early in the morning until late at night in the best way possible, on foot with his trusted Konika camera. 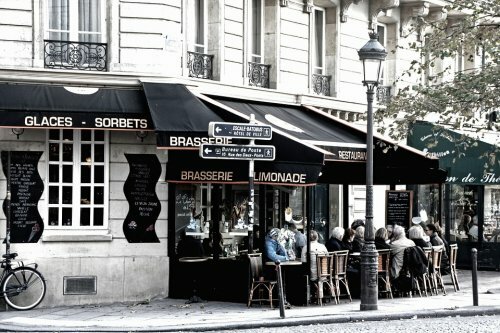 During the day, the two would take on the quest to discover the best soupe a l’oignon in Paris, from bistro to terrace. As the years passed they would return to Paris many times, and grandpa would keep walking and snapping pictures along the way in the Jardin du Luxembourg, at Notre Dame and many photos of his favorite, Les Invalides. When he would return home and develop the photos he would organize and label the back of each. One summer day spent with him upon their return, I sat and watched him record each photo with all the details and I began to ask questions. As he describe the photos and told me the stories, I started to fall in love with Paris. For my grandpa he saw the beauty in Paris’ stunning churches and facades but also in the French people. His journal is filled with mentions of the “woman taxi driver with her white poodle from Lyon” and “Pierre who stopped at the same café for his coffee every morning on his way to the office”. 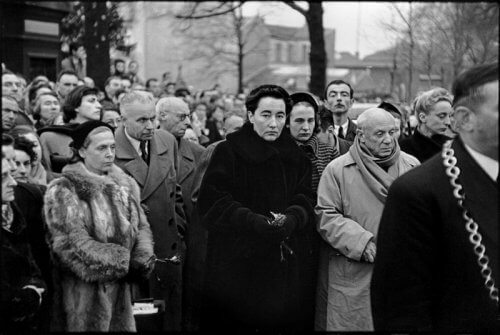 Many years later on my own first trip to Paris I slid a few of his pictures into the back sleeve of my moleskine notebook, mostly just to have a piece of him and my grandmother with me. 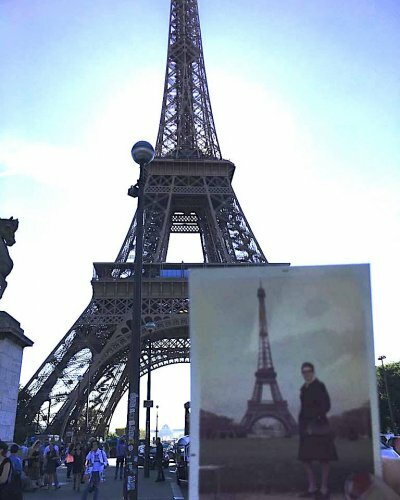 One day near the Eiffel Tower I pulled out the photo of my grandma standing in front of the iconic structure. I held up my grandfather’s portrait of her and snapped a my own photo standing in nearly the same spot. On each following trip I would take a few more photos with me to retrace his steps using his journal and photography. 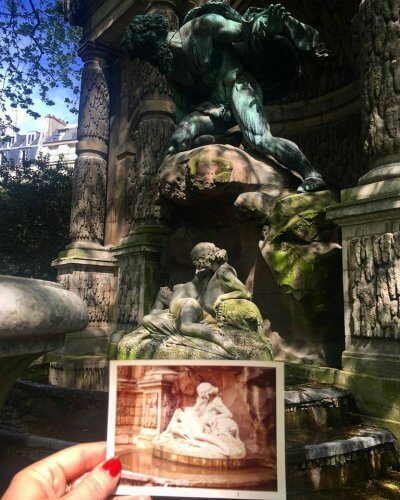 This past April one afternoon in one of my favorite places, the Jardin du Luxembourg, I had his photo of the Medici fountain with me and decided to recreate the shot. The Medici fountain is a peaceful oasis under the cover of trees where time stands still. When you sit in those iconic green park chairs the large grotto like fountain and accompanying statues loom down upon you. The perfect amount of light always manages to seep in through the dense trees in a way that cast shadows onto the large statue of Polyphemus as he discovers the lovers Acis and Galatea by Auguste Ottin. After lining up the photo and snapping away I turned it over and to my surprise, I was standing in the exact same spot as he did to the exact day precisely 46 years later. 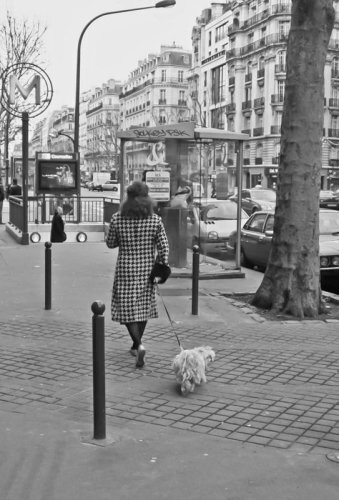 I have since taken many photos, retracing his journey through the streets and gardens of Paris. He passed away in 1994, long before I made that first trip to Paris but through his pictures, I have discovered more than just a city. On an early Sunday morning when the threat of rain was in the air I impulsively decided to just keep walking a little farther rather than jump on the metro. As I walked past a building with a unique carving in its stone, it looked rather familiar and then I saw the literal writing on the wall. 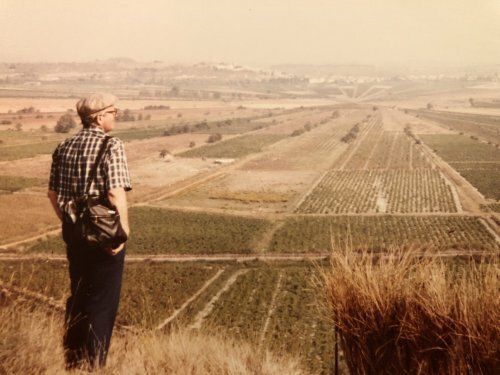 I pulled out my grandpa’s photo and sure enough, I was standing in the exact same place. 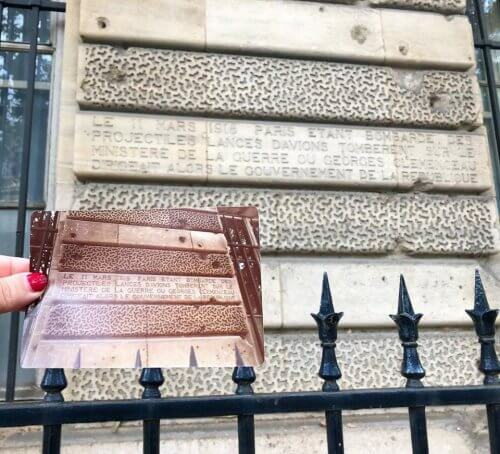 The building was hit on the 11th of March 1918 during World War I by projectile missiles which left their mark on the building remaining unchanged some 100 years later. It was this photo of all of his that is one of my favorites, and it’s not of the Eiffel Tower, Notre Dame or the Jardin du Luxembourg. It is simply a building that most would never stop and look at, but like him I was wandering down the same street just taking it all in when saw the those marks and commemorative words on the building. Separated only by time we both stood on the same spot and instinctually reached for our cameras. Without even understanding it as I look back through his journals and thumb through his photos of Paris I realize I am experiencing the city just as he did. Even down to the way I note what I do each day, just as he did it. I wish more than anything I could have been here with him walking the streets of Paris, but often I believe he is somewhere there walking alongside me guiding me through this incredible Parisian journey. 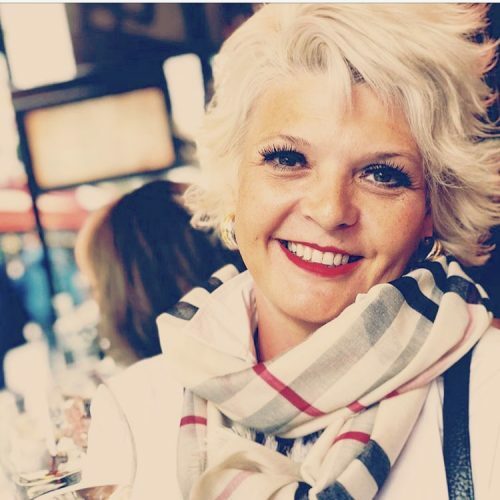 Claudine Hemingway is a Portland event maven splitting time between PDX and Paris. Strolling the streets, drinking champagne, eating duck confit and capturing every detail. Yes she is distantly related to that Hemingway. Note: Perfect your own Paris Photographs on our September Photo Journey with Georgianna Lane. Learn more here.